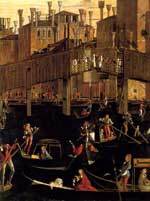 Early Italian Renaissance the history of artistic achievement. An artistic dynasty of Venice. 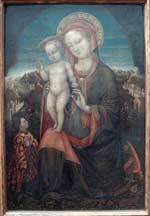 The Bellini family were a well known artistic dynasty from the city of Venice. Giovanni is the most well known, but both his brother Gentile and his father Jacopo were also well regarded as painters. 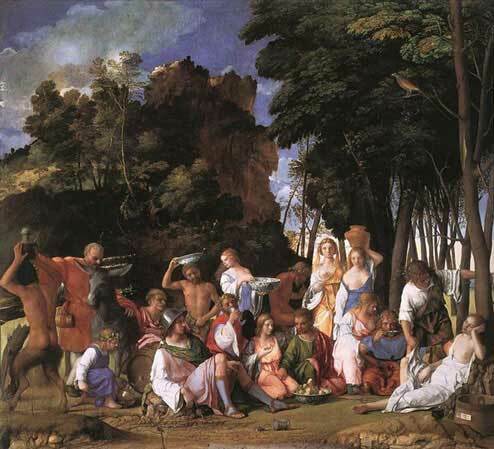 Jacopo was one of the founders of the Renaissance style of painting. Born in c.1400 many of his most important works have disappeared but his workshop was the most productive in Venice. Gentile was born in c.1429 and has been rather overshadowed by his brother Giovanni, however in his lifetime he was famous as one of the foremost painters in Venice. 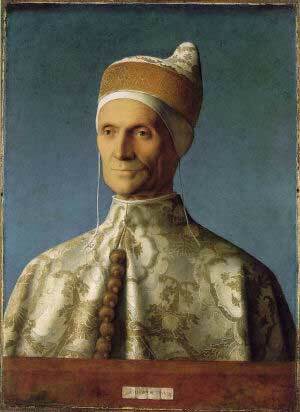 He was also the official portrait artist for the Doges of Venice. Giovanni was born in about 1431 and grew up with his brother in his father's house in Venice. His brother-in-law was Andrea Mantegna and Andrea's influence is apparent in "The Agony in the Garden" painted in 1459-1465. I have seen this painting in the National Gallery in London. The foreshortening of the reclining figure, plus the metallic quality of the clothing, owe much to the influence of Andrea Mantegna, and the landscape could almost be a scene from a surrealist painting, very Dali! The Miracle of the True Cross. collaboration with various artists of the day. On the death of his brother Gentile, Giovanni became the most prominent artist in Venice but was deluged with more commissions than he could complete and had difficulty in delivering the various works on time. In his old age Giovanni painted "The Feast of the Gods", a work regarded as a Renaissance masterpiece, but Giovanni died in 1516. The picture was finished by his former pupil Titian. 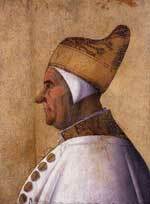 Most of his work in the Doge's Palace was destroyed by fire in 1577 but some of his official portraits of the Doges survive, such as "The Doge Leonardo Loredan" of 1502. Giovanni was appointed as conservator of the paintings in the ducal palace in Venice and was paid a fixed annual pension for his work. 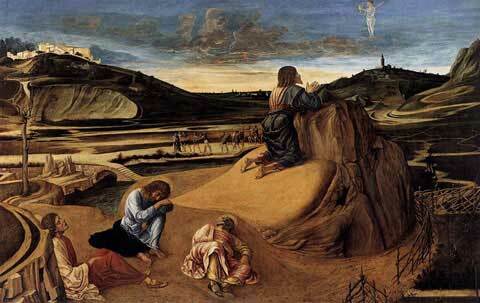 He was at the head of a famous workshop and his pupils included Giorgione and Titian. 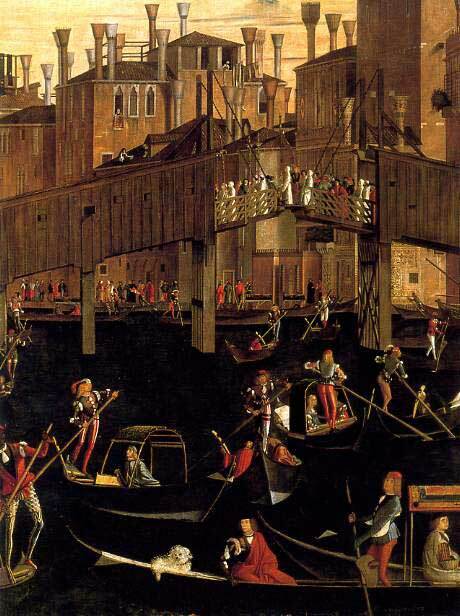 His mastery of the oil painting medium, newly introduced to Venice in the 1470s, had a profound influence on his famous apprentices. "The Feast of the Gods" 1514. 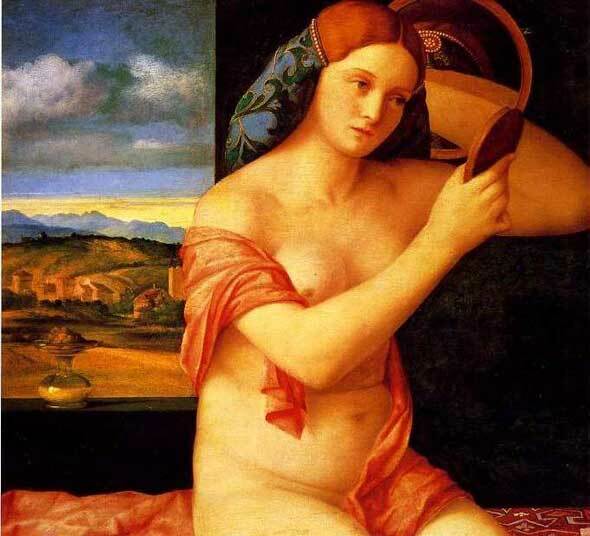 (w) Bellini and Titian. National Gallery of Art. Washington. The Lady Combing her hair is one of the artist's final works and was painted when he was eighty-five years old. Almost all of his art had been preoccupied with religious subjects but this is a refreshing and charming late change that mirrored the evolving Venetian style.